Lodore Falls the waterfall is situated at the back of Lodore Falls Hotel near the Grange end of Derwent Water and because the falls are in the private grounds of the hotel there is an honesty box to view the waterfall. Lodore Falls is formed by the beck from Watendlath Tarn cascading over huge boulders for a distance of 100 feet. The falls are spectacular after heavy periods of rain but can dry to a trickle after long periods of dry weather. Lodore Falls have been popular since Victorian Times and made more famous by Robert Southey poem ‘Cataract of Lodore’ in 1820. Watendlath is a very attractive hamlet and tarn owned by the National Trust and is situated at 263 metres between the Borrowdale and Thirlmere valleys surrounded by fells in a classic ‘hanging valley’. Watendlath Tarn is 7 acres in size and was given to the National Trust by Queen Victoria’s daughter, Princess Louise, in memory of her brother, King Edward VII. Blea Tarn Gill 210 metres above Watendlath Tarn, provides the tarn with its water which then flows into Watendlath Beck and eventually feeds Lodore Falls, a tourist attraction from Victorian times, and ends up in Derwent Water. The tarn is stocked with brown trout and rainbow trout and is popular with anglers. The Lakeland farm and the herd of Herdwick sheep are rented out by the National Trust aiming to ensure this rare breed survives. The hamlet houses a cafe, a tea room and also a Bothy which sits next to the tarn and should be treated very much as a ‘stone tent’ as it has very basic facilities so visitors are advised to take their own equipment as for camping. The traditional packhorse bridge leading into Watendlath is the most well known and most photographed packhorse bridge in England. The famous painting of Watendlath, by Dora Carrington in the early 20th century, hangs in the Tate Gallery. Watendlath was used by Sir Hugh Walpole as a setting for the fictional home of Judith Paris in his haunting Herries saga published in the early 1930’s. 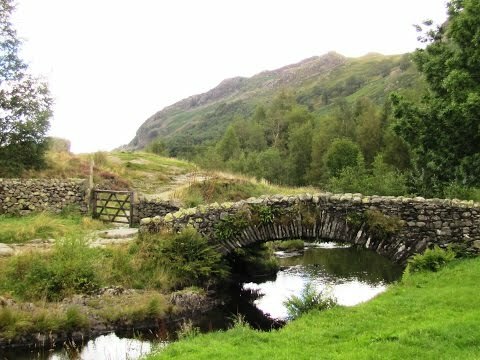 Watendlath can be reached by a single track unmarked road leading off the Borrowdale Road. It is a steep climb with passing places and crosses the famous Ashness Bridge and then past Surprise View where it is possible to park and admire the whole view of the Derwent Water valley. There are no barriers at this cliff top so please take care with children. Keswick is a market town now mainly tourist orientated due to the many thousands of tourists visiting every year and the majority of side streets are abundant with B&B’s. Moot Hall built in 1813 situated in the centre of Keswick was once the town hall but is now a tourist information centre and it is here in the square where the market is held every Saturday. During the 16th century Keswick was home to copper and lead mining on a small scale and the town was also the source of the world’s first graphite pencils. The pencil industry continued in the town until 2008 when it then moved to Workington. The Cumberland Pencil Museum and the Mining Museum are both close to the centre and are excellent places to visit on rainy days. Rosthwaite is a very small village, six miles south of Keswick, consisting of a few houses, the Royal Oak pub and the Flock-in Tearoom for walkers. From the car park we cross over the road into the trees and turn right. We follow the path adjacent to the road then at the white arrow on a post we bear left slightly uphill. When we reach the back of the Lodore Hotel we turn left uphill at another white arrow on a post. After viewing the waterfall from a view point we take the path on the left of the falls. When the path splits we go steeply uphill over the tree roots at the back of the holly tree. At the top of the steep incline we turn right below a rock face and follow the path through the trees. When the path splits we take the left one slightly uphill. At the stile we cross over and head forwards with the beck still on our right. We drop down and as the path starts to rise again it splits into two we turn right and head forwards the beck still on our right. We soon come to a path we turn right. At the gate we go through and turn immediate left uphill. At the next gate we turn right onto the minor road and head forwards until we come to Watendlath. We have a wonder about the village and take a look at Watendlath Tarn. We then return to the centre and cross over the little old stone footbridge and turn right. We now keep following the path with the beck on our right. When we come to a wooden bridge over the beck we turn left slightly uphill and follow the wall on our right. We soon turn right through a gate in the wall and head forwards through the trees. When we see the beck in front of us the path splits we bear left and follow the beck on our right. We go through a gate and soon the path starts to go downhill to meet the road at the Borrowdale Hotel. We turn right and follow the road using the footpath. We pass the public toilets and the Lodore Falls Hotel and after crossing the bridge we take the footpath on the right into the trees and turn left. We now retrace our steps back to the car park. There is one steep incline up the side of Lodore Falls the rest of the walk is easy to moderate on grassy and stony paths and tracks. There is a section of minor road into Watendlath and a section of main road with a footpath along side from the Borrowdale Hotel back to the car park. Elevation: approx lowest point 76.6m (251.3ft) approx highest point 270.4m (887ft) approx ascent 304.7m (999.7ft). Approx 5.5 miles allow 2½ to 3 hours using OS Explorer Map OL4, The English Lakes, North-Western area. This walk is clockwise. Start point: Kettlewell pay and display car park. Lodore Falls is in the Borrowdale Valley in the Lake District, Cumbria. From the A66 coming from the east take the A5271 for Keswick. At the junction turn right. At the traffic lights carry on forward. At the mini roundabout turn left and follow road round to the left. At the roundabout go straight over then at the next roundabout turn right. Follow this road the B5289 and after passing the road sign to Watendlath on the left start looking for Kettlewell car park on the right. Parking: Kettlewell pay and display car park £6.50 for all day. The car park at Watendlath is also £6.50 for all day if you wish to do the walk from there or just to visit Watendlath. There are public toilets in the car park at Watendlath and on the B5289 near the Lodore Falls Hotel. The next nearest ones are at Rosthwaite next to the car park and at Keswick. For refreshments there is a cafe and a tearoom at Watendlath and at Rosthwaite there is the Royal Oak pub and the Flock-in Tearoom at Yew Tree Farm. There are many more pubs, cafes and shops to choose from at Keswick.